Made to order: Taziki’s serves up a Mediterranean salad with grilled salmon. Over the summer, Subway asked the Harris Poll to conduct a survey to find out whether Americans were eating their vegetables. The results were abysmal. Of the 2,000 people surveyed, 84 percent weren’t eating the recommended four servings of veggies per day; the average barely managed two servings. The bright spot? Millennials, who ate nearly half a serving more than the older participants surveyed. Sadly for Subway, those vegetable eaters aren’t getting that extra helping of greens from a footlong sandwich. More and more, they are turning to fast- casual franchise brands that feature fresh ingredients prepped in-house. Some brands are even able to serve locally sourced produce. It’s a far cry from the franchise fare that dominated the landscape just a few years ago. The holy grail of franchising in recent decades has been “healthy” fast food. For the most part, that has meant reengineering traditional offerings, like taking the fat out of french fries (à la Burger King’s poorly received Satisfries) or serving egg-white-only breakfast foods (seen at McDonald’s and Dunkin’ Donuts). That way of thinking has led to a number of flops. But taking a cue from Chipotle, many franchise operators are realizing that a little forethought and a lot of chopping can lead to tasty, relatively healthful options that appeal to consumers who are concerned with nutrition but still seeking a quick bite. They can also accommodate varying dietary standards, from vegetarian to vegan, flexitarian to gluten-free. And most surprising of all, customers are showing a willingness to get out of their cars for 20 minutes to actually enjoy the options. No one is more flabbergasted by the rapid greening of American franchises than Paul Steck, president and CEO of Conshohocken, Pa.-based Saladworks. The 29- year-old franchise brand has 104 domestic and four international units that serve made-to-order entrée-size salads. Keely Newman, CEO of Grabbagreen, agrees that there’s been a sea change in American dining, admitting that she doesn’t believe her concept would have been viable even five years ago. The Scottsdale, Ariz.-based chain—which has three locations in the Phoenix metro area and recently signed multi-unit deals for North and South Carolina, Colorado and Southern California—was founded two years ago when Newman and her friend Kelley Bird became frustrated with the lack of healthful on-the-go options. Grabbagreen’s fare, which includes the requisite smoothies and bowls, distinguishes itself with adventurous ingredients such as quinoa noodles and yogurt agave barbecue sauce. Those items wouldn’t have flown in 2010. Now, fast casual seems to have reached a tipping point. 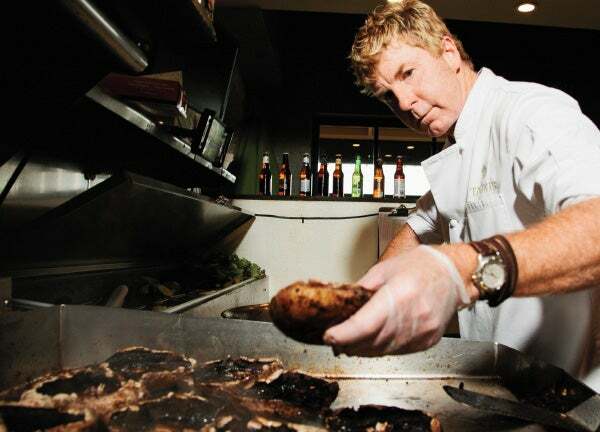 Chef-driven: Keith Richards of Taziki’s. Keith Richards has also had his eye on changing tastes in the U.S. He launched his franchise, Taziki’s Mediterranean Cafe, after a trip to Greece in 1997. And while people in Birmingham, Ala., the chain’s home base, appreciated his made-from-scratch fare from the start, he says it’s only in the past few years that the concept has caught fire. Now Taziki’s has 48 units in the South and is slowly expanding up the East Coast. He admits that some items served at Saladworks, like chickpeas, come out of a can, as they do at most restaurants. “But the vast majority of items we serve— cucumbers, carrots, onions, tomatoes, peppers—are passionately prepped and diced at store level vs. by a robot in a factory,” he adds. Jason’s Deli, a franchise concept that started in 1976 in Beaumont, Texas, could have taken the easy road of buying bagged produce, especially when stocking its 39-item salad bar. Instead, the company, which now has more than 260 units, uses fresh, whole vegetables. Focusing on fresh ingredients instead of relying on premade or frozen foods also allows patrons greater options for customization. While forward-thinking fast-casual franchises have a good handle on fresh food, consumer demand doesn’t stop there. Many want their ingredients not just fresh, but locally sourced. That is a nut most systems have yet to crack, but not for lack of trying. 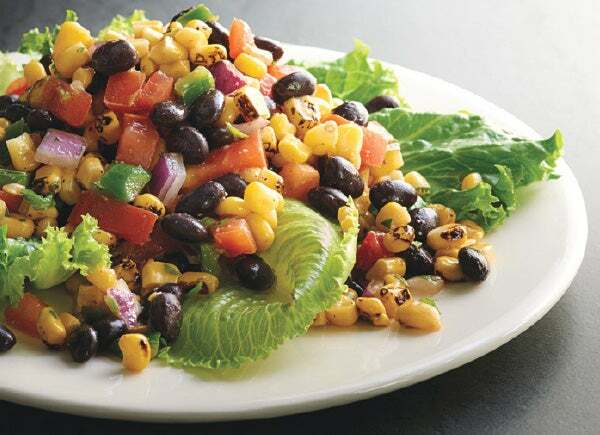 Meatless mix: Roasted corn and black bean salad at Jason’s Deli. Image Credit: Deli Management, Inc.
And occasionally those people still demand a burger, which is a niche North Palm Beach, Fla.-based BurgerFi aims to fill. When he first came to the concept as marketing and creative director, Ronn Pearson was blown away by BurgerFi’s gourmet kitchens. “We use 14 different ingredients to make our veggie patty,” he says, noting the flavor and texture rely on a meticulous prep and cooking process. At the same time, some menu items require little more than their natural flavor to meet the restaurant’s standards. BurgerFi, which will have more than 100 units by the end of the year, has founders who came from the world of fine dining and didn’t realize they could take short cuts. Instead, they started building their burgers using fresh antibiotic- and hormone-free open-range beef. Sauces, toppings and sides are made from scratch.